How does one finesse a flat steel plate into a graceful cylindrical shape, the answer, JMT’s four roll plate rolling machines. 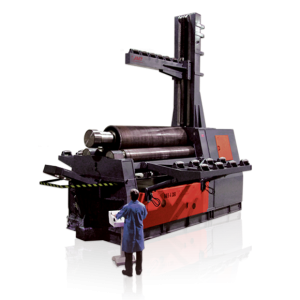 JMT’s four roll machines are designed to handle the massive pressures required to hold and bend these thick plates and sheets. The fastest and most accurate bends are made by 4 roll plate rollers. The plate is held securely between the top and bottom rolls while the side rolls move vertically to create the bend. Plate feeding can take place on either side of a four roll rolling machine. If fed from only one side, they can even be placed up against the wall to save floor space. The side rolls are positioned to the right and the left of the bottom roll and are on their own axes. The independent axis of each roll helps make a “perfect bend.” The back side roll (at the far side of the feeding point) also functions as a back gauge to square the plate for proper alignment. This eliminates the need for additional personnel to assist the operator. JMT 4 roll plate rollers do not require the operator to remove, flip, and then try to square and reposition the plate a second time after pre-bending as is the case with 3 roll initial pinch machines. Keeping the material in the machine makes four rolls 50% more efficient than three roll initial pinch machines, and allows a cylinder to be rolled to the required diameter immediately following pre-bending. Bending the back edge takes place after the cylinder is rolled, for a one direction single pass completed cylindrical piece part. If quality components are important to you, then you will no doubt be a believer of JMT’s HRB-4 series plate rolls. If you build something to last, then you must start with a solid foundation. Our factory engineers utilize parametric 3 D engineering with a dash of mechanical and kinematic analysis to design our highly ridged framework. The HRB’s start with a stress relieved frame engineered with additional steel supports and finished in a 5 axis c-n-c- machining center so as to guarantee absolute parallelism of all surfaces. Accuracy of roll movement is paramount. The HRB’s are designed to utilize planetary guides on rolls of 17 inch or smaller. Roll diameters of larger diameter are controlled by rectilinear guides providing the controlled movement required to create accurate bends and increase the longevity of the machines life. This system allows bending of as small as 1.1 times the diameter of the top roll, providing the tightest radius in the industry. If you can’t transfer torque to the sheet or plate than you might just as well turn off the lights and go home. JMT’s HRB series 4 roll plate rollers have torque to spare! Because of ultra high torque, JMT plate rolls produce cylinders in less number of steps than our competitor’s machines. Rolls are independently driven by high torque hydraulic motors and planetary gearboxes. The drive system is positioned on the same axis as the roll so almost 100 % of the torque generated by the drive system is applied directly to the sheet. Highly engineered hydraulic systems are a benefit to a machine tool only as long as the system functions without breakdown. The hydraulic components installed in JMT’s HRB series plate rolling couldn’t have a better pedigree. Almost to the last component, every part of the hydraulic system is world renowned Bosch-Rexroth componentry. In fact Bosh-Rexroth assisted in the system design and created specialized components just for the HRB’s hydraulic system. An added benefit of their involvement is the availability to source these components locally, if replacement components are ever needed. Also included in the original design of the hydraulic system is the industry’s strongest hydraulic braking system designed to prevent plate slippage during bending. To keep the rolls running true for years and years of service, are spherical bearings sourced from the best bearing manufacture’s in the world. Hydraulic roll crowning compensation allows for the rolling of different thicknesses of material with minimal deformation of the plate or sheet. Synchronization between the rolls is achieved by Resistive Linear Position Transducer and P.L.C. to achieve the highest accuracy attainable. Thru superior construction and design, a massive heavy weight body and the ability to angle bottom and side rolls the JMT HRB 4 can bend wide angle and small diameter conical parts with ease, with minimal effort from the operator. While most machines on the market can conically bend three times the diameter of the top roll, the JMT HRB-4 can conically bend 1.5 times the diameter of the top roll and frequently smaller diameters than that. Not to be out done, the electrical system can boast componentry from the world’s highest quality manufacture’s as well. Open up the main electrical panel and you will be greeted by Siemens components everywhere you look. Siemans needs no introduction, arguably the highest quality electrical components on the planet, and guess what, you can source them right down the street from you facility, if replacement is ever needed. If you’re the controlling type, the available controls will pique your interest. The HRB-4 comes standard with a P.L.C. with digital readout. Available optional controllers include N.C. as well as C-N-C. Each controller provides an increase of control capabilities as you select the more advanced controller. As you can see JMT-USA rolls past the competition, because we can. We invite you to look more closely at our product offering, we invite you to look more closely at JMT-USA and our more than 50 years of serving our customers. You want customer testimonials? How many hours do you have to spend?